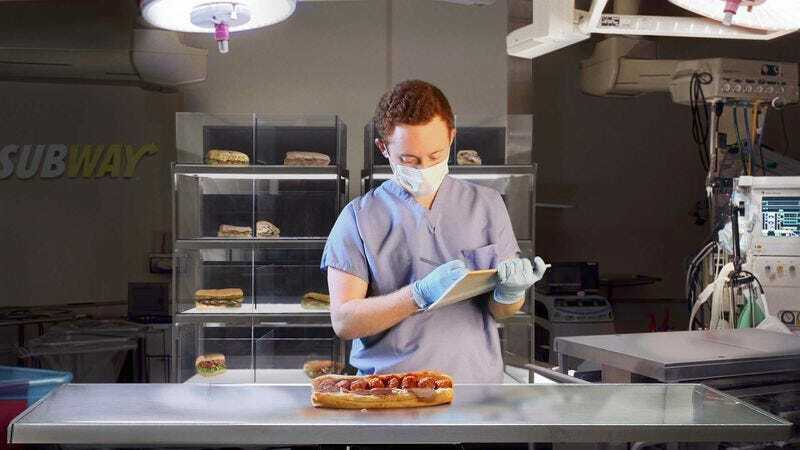 A technician examines the hybrid specimen inside Subway’s sandwich breeding facility, where the first miniature 6-inch breeds of subs were originally developed in the late 1960s. MILFORD, CT—Announcing the creation of a genetically viable new menu item they said could soon appear in franchises nationwide, researchers with Subway’s sandwich breeding program revealed Thursday they had successfully developed a Black Forest Ham–Meatball Marinara hybrid. The footlong sub, which company officials say was selectively bred to incorporate the zesty traits of the Meatball Marinara bloodline with the natural smokiness of the Black Forest Ham genus, was unveiled at a press conference at Subway’s main sandwich breeding and husbandry facility within its corporate headquarters. “Everyone involved in the creation of S-74G—or the Black Forest Marinara Combo, as it has been dubbed by our team of geneticists—should be extremely proud,” he added. According to Plattner, the hybrid sandwich began as an attempt to improve the stock of the popular but increasingly inbred Meatball Marinara pedigree by crossbreeding it with a suitable mate. Scientists at the company’s state-of-the-art $200 million breeding laboratory identified the Black Forest Ham as a possible sire due to its heartiness, adaptability, and hereditary cheese layers. After observing improvements in longevity and succulence over the first several generations of offspring, the research team reportedly decided to ramp up the number of mating sessions per week in the hopes of breeding out a latent sogginess trait and increasing the progeny’s natural tolerance to a wider variety of sauces. Subway officials went on to note how smoothly the process of crossing the two disparate subgenera had gone, given that the varying windows of fertility for each sandwich breed often cause complications for mating. Company scientists also explained the vital role that the various strains’ temperaments play in the interbreeding process, citing an incident in 2009 when an entire brood of docile Veggie Delite sandwiches were lost after being left unsupervised around a group of much larger and more aggressive Steak & Cheese subs. In another case illustrating the challenges of sandwich husbandry, Plattner described how researchers had spent months trying to coax the notoriously wary and apprehensive Subway Club and a Spicy Italian to breed naturally before finally resorting to artificial insemination.